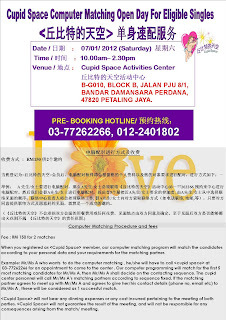 Cupid Space Activities Center is opening on 07/01/2012（Saturday) form 10.00am -2.30pm at Damansara Perdana venue for cupid member to do the computer matching service， those member whom are interested to do the computer matching, pls call 03-77262266/012-2401802 for appointment. Single Malaysian Chinese (male and female) at age range between 25-42 years old. all specially design to break the ice and build-up friendship among the participants. 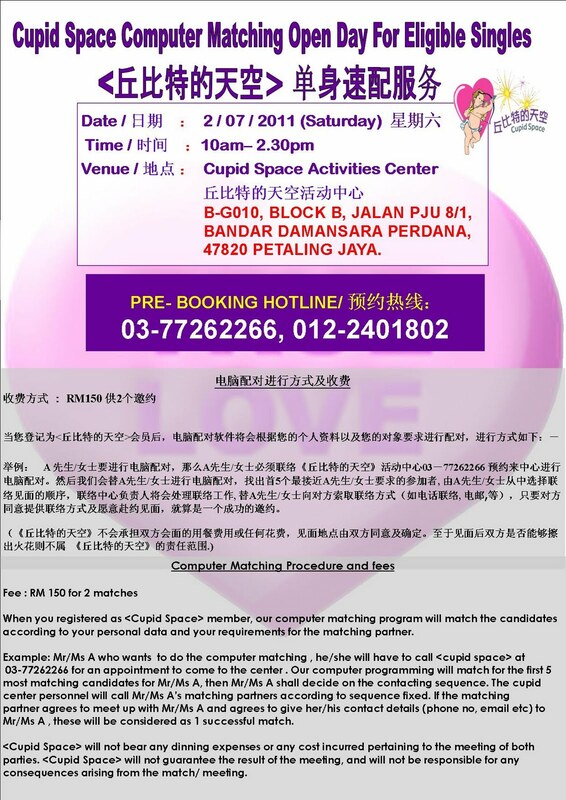 Cupid Space Wanita MCA will open a registration counter at Level 6, Wisma MCA of Jalan Ampang, on 03/12 (Saturday), 04/12 (Sunday) and 10/12 (Saturday), at 11.30am-3.30pm. Those who are interested to take part , please bring along 1 photocopy of NRIC , 1 passport size photo and 1 3R size photo for Commissioner for Oaths declaration use, only those who are legally single is allow to participate. Booking closing date is on 11/12/2011. 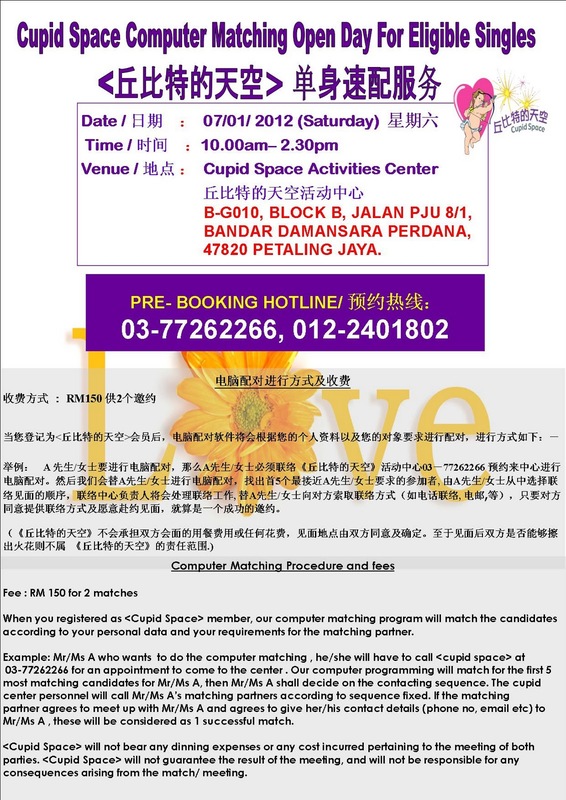 For further info please call 03-77262266, 012-2401802 or log in http://www.cupidspacedating.com . 1 张，并于上 述 时 间 亲 临 马 华 大 厦 进 行 宣 誓 以 及 报 名，所 有 参 加 者 必 须 在 法 律 上 属 於 单 身 才 有 资 格 报 名。报 名 截 止 日 期 为11/12/2011.